A Slice of Smith Life: Horsin' Around with (another) Gymnastics Birthday Party! Horsin' Around with (another) Gymnastics Birthday Party! Tomorrow, November 19th, our #4 Cupcake will be turning 5 years old! Wow, how time flies when you are having fun! ....in a blink of an eye??? Today we celebrated our Cupcake's 5th birthday with a gymnastics party at a local gym where we celebrated her siblings' birthdays in years past with this gymnastics cake and this horse cake. Our big 5 year old wanted a horse cake for her party so I thought about how cute these horse cupcakes were for my niece's birthday that my sister-in-law and I made, but I knew I had an especially busy weekend and I didn't have time to assemble individual horses on cupcakes like we did this past summer. So where's the latest and best place to find fun and creative ideas? Well, Pinterest of course! I searched "Horse Cakes" within Pinterest and found a horse made out of cupcakes! Perfect! I used 23 cupcakes total and placed them in a shape of a horse and then used my quick and easy decorative toothpicks using a clip art image from my computer to make the horse heads on toothpicks to surround the cupcake horse. I made both the yellow and chocolate cupcakes from scratch and the white cream cheese icing and chocolate icing were from scratch too! I've made the yellow cake and cream cheese icing before when I made this soccer cake and other cakes, but I have never tried making chocolate cake and icing before now. I just followed the recipe off the back of the Hershey's Cocoa can to make the batter and icing...easy and no hydrogenated oils! These were delicious and really not too difficult to make! I don't think I will ever buy boxed cake mix or canned icing again! I used a Wilton icing bag and #21 tip to make the chocolate icing in a twirl pattern. My Husband and I got in on the fun too! Happy, Happy Birthday to our precious 5 year old! We love you! Happy Birthday to your Little Cupcake. Her party looked so fun. 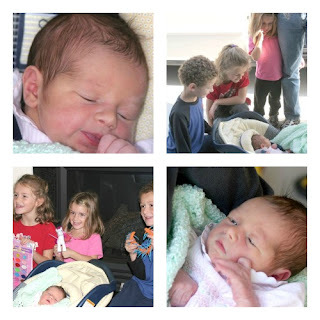 Thank you for sharing your family milestones at my Our Favorite Things Link Party. Have a blessed week. What an absolutely beautiful newborn baby!!! It does pass quickly doesn't it? That horse cupcake cake was amazing! I love pinterest. It looks as though she had a great day! Tracy, you are amazing AND a wonderful mother! I am going to have to make that cupcake horse for someone soon! Really cute!